Two days in Kyoto allows you to see a lot, but you still have to work efficiently. This itinerary is the way to make the most of two days in Kyoto. This two-day route takes you through Kyoto’s main sightseeing districts: Southern Higashiyama and Arashiyama. This is a good route to do in the off-season (summer or winter). In high-season (spring and fall), it will be too crowded for comfort. 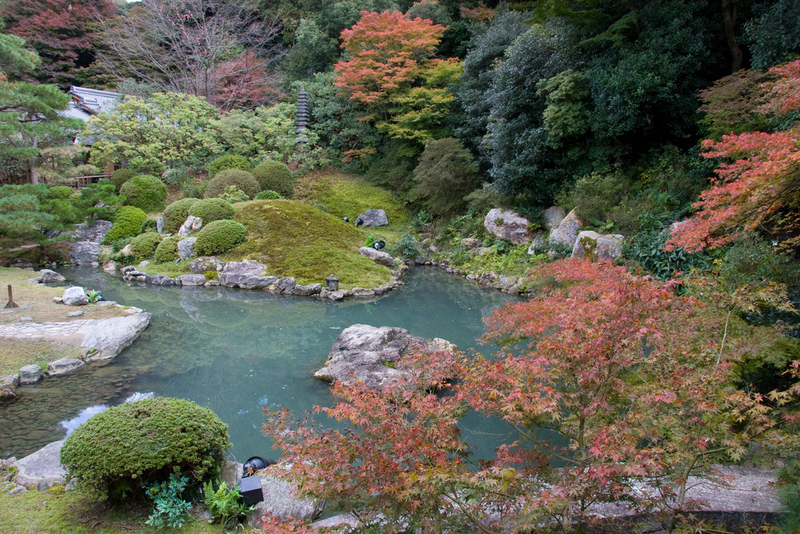 If you will be in Kyoto in high-season, or simply like quieter spots, check out our Off the Beaten Track Itineraries. If you’ll be in town during cherry blossom season, check out our Kyoto Cherry Blossom Itinerary. Take a bus or taxi to the Gojo-Kawaramachi intersection. The closest bus stop is Gojozaka. 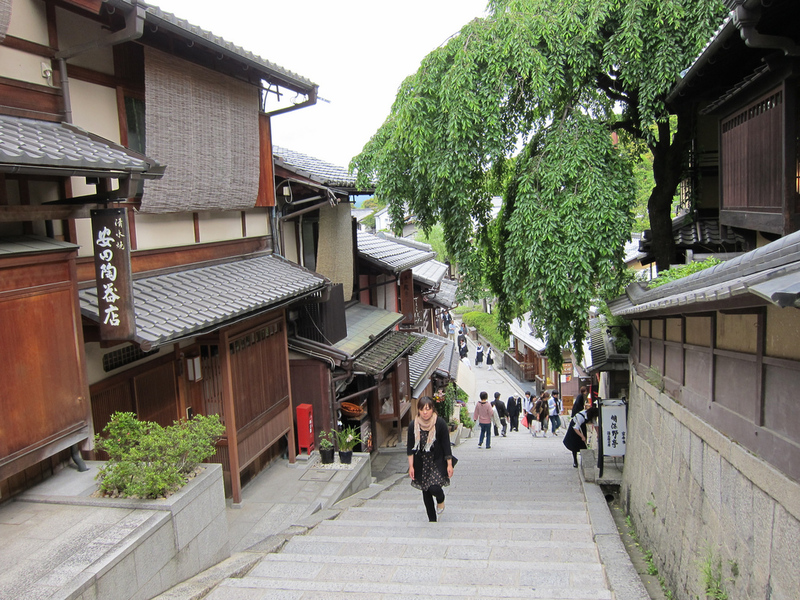 Walk up Gojo-zaka, which is the main street that leads east, up the hill, to Kiyomizu-dera Temple. Most likely, you can just follow the people. Halfway up, you can bear right up Chawan-zaka, which gets you away from most of the cars and buses. Enter the temple and fully explore the temple. Don’t forget to visit the wonderful Tainai-Meguri. After exploring Kiyomizu-dera, exit via the front of the temple and walk down Matsubara-dori Street (lined with shops) to reach the lovely preserved district of Sannen-zaka Hill. Continue down the street to where it flattens out and then go a bit further and take a right down into Ninnen-zaka, another lovely preserved district. You will come to a larger cross street with cars. Go left down the hill then quickly turn right into Nene-no-Michi, which is mostly free from cars. Follow this north, with one quick right-left jog to reach Maruyama-koen Park. Exit the north side of Maruyama-koen and follow the street north to the impressive main gate of Chion-in Temple. Climb the steep steps and enter the wide courtyard of Chion-in. The main hall is under construction how and will be for several years, so you don’t have to linger here. Return down the steps and continue north. 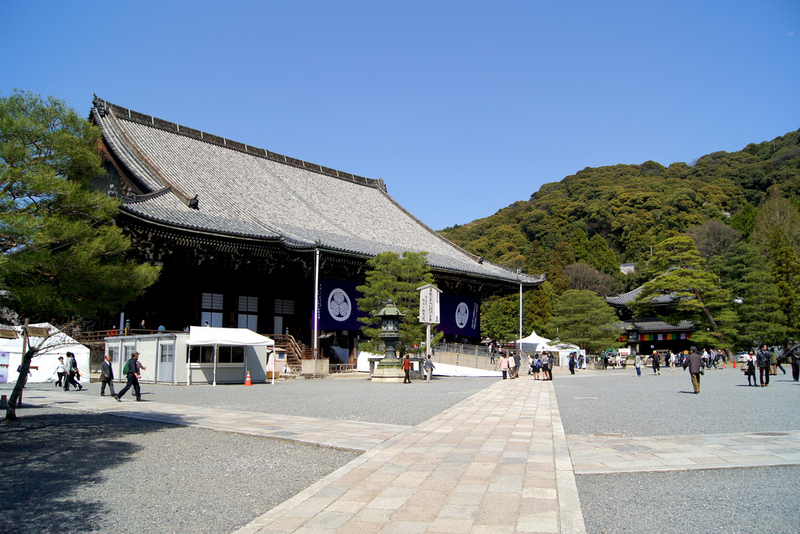 You’ll soon pass the enormous camphor trees in front of Shoren-in Temple. 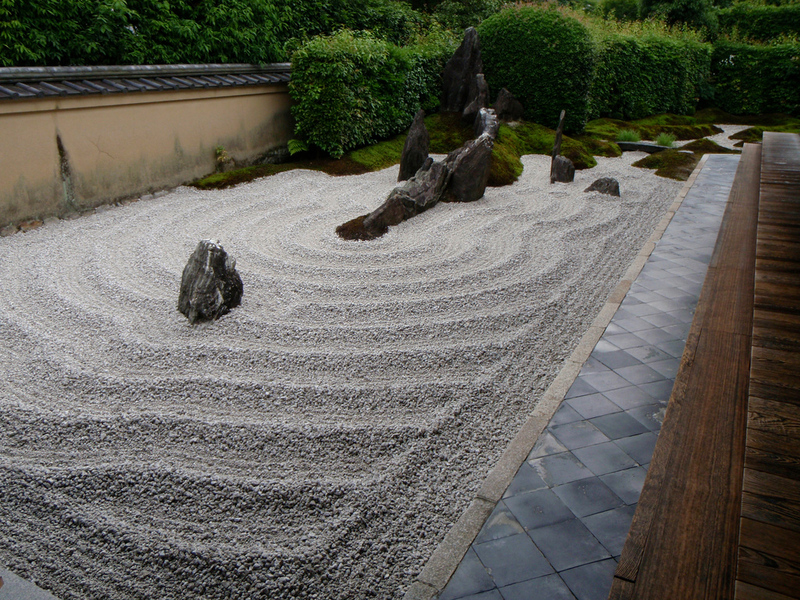 Enter the temple and enjoy a nice cup of green tea and a sweet while looking out over the garden. Exit Shoren-in and walk north (downhill) to reach Sanjo-dori Street. Walk a short distance west (left) on Sanjo-dori to reach Higashiyama Station on the Tozai subway line. Take it two stops west and get off at Kyoto Shiyakushomae (downtown). There’s an almost endless selection of places to eat downtown. 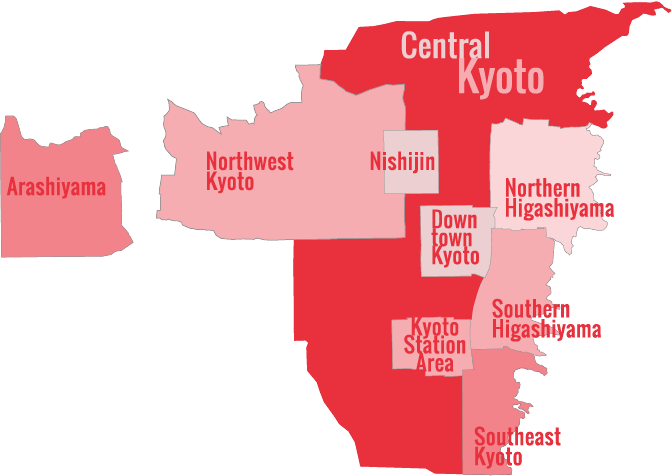 For some picks, check out our Downtown Kyoto District page. 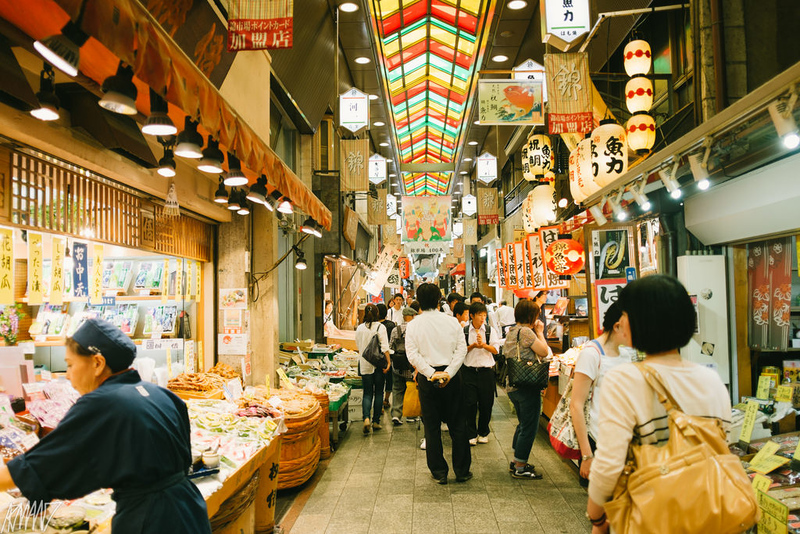 After eating lunch, make your way to the east end of Nishiki Market (where it joins the Teramachi Shopping Arcade). It’s usually crowded here, even during the off-season. Hint: If you get tired of the crowds, you can bail by walking one block south and continuing along Shijo-dori Street. After you emerge from the west end of Nishiki, continue straight for a block and you’ll see Daimaru Department Store on your left. Go down the stairs in front of the entrance and enter the food floor. 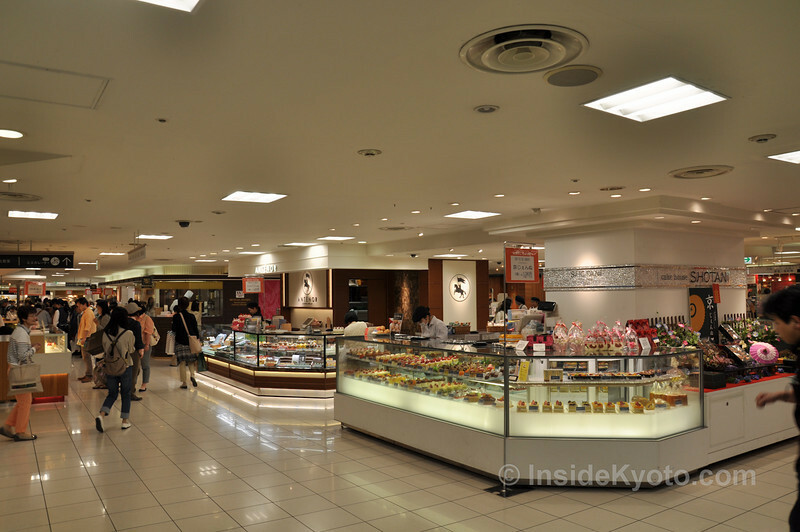 Explore the food floor and be sure to check out the Japanese sweets and tea section. Exit Daimaru via the main entrance onto Shijo-dori Street. Walk east on Shijo-dori, across the Kamo-gawa River, and walk downstairs into Keihan Gion-Shijo Station. Take the Keihan Line south to Fushimi-Inari Station (all trains EXCEPT the limited express stop at Fushimi-Inari). The way is clearly marked from the station. Walk out of the station, take a left and walk up the hill, crossing the JR tracks. After crossing one relatively major street, you will see the first torii (gate) of the shrine. 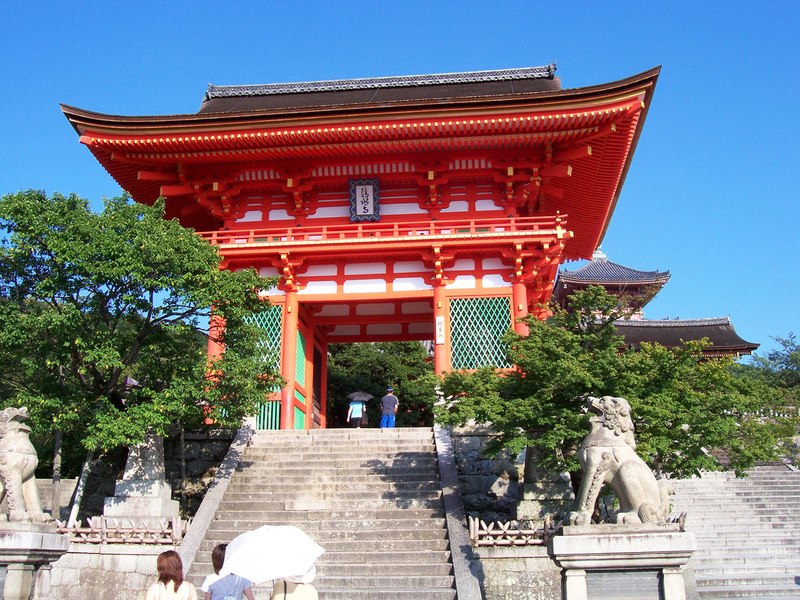 Walk up through this and you’ll shortly get to the main precinct of the shrine. 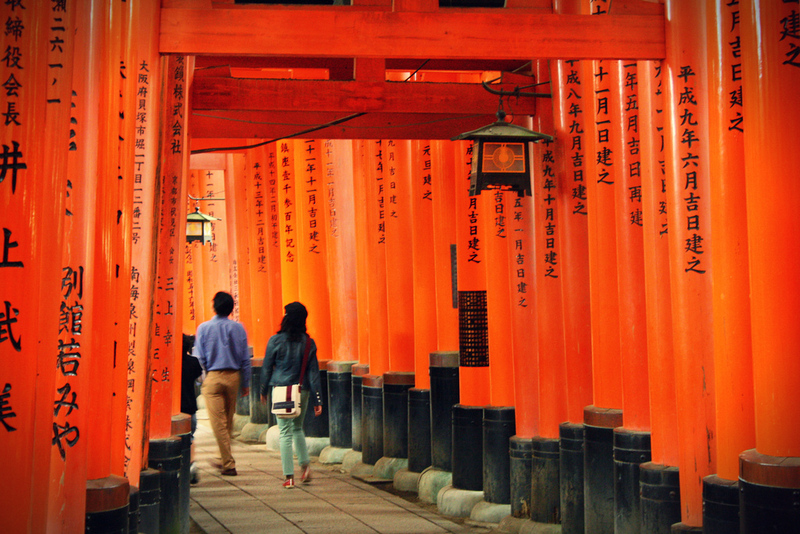 Our Fushimi-Inari Hike gives a detailed route description. We don’t suggest doing the whole route on this day, but going up as far as Shin-ike Pond is a good idea. By this point, you’ll definitely be in need of a rest. Take either the Keihan Line or the JR Line back from Fushimi-Inari to central Kyoto, depending upon where in town you are staying. Downtown Kyoto has the best selection of restaurants in town. For some picks, check out our Downtown Kyoto District page. 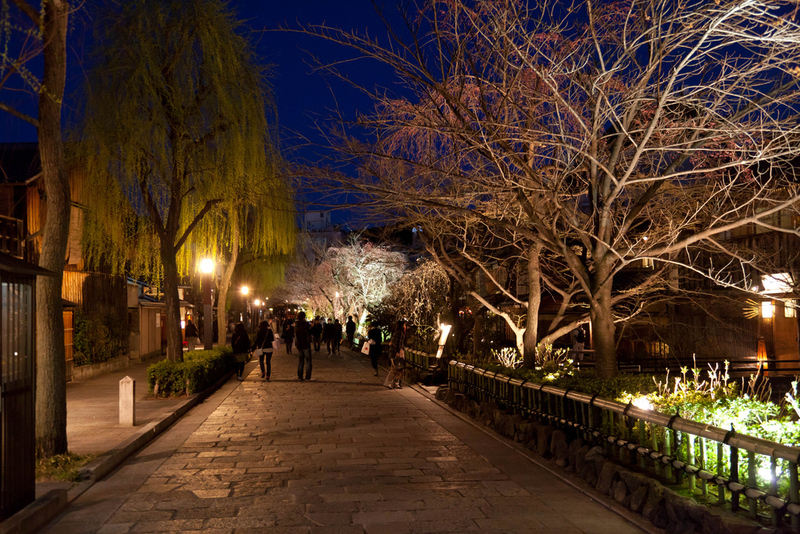 After dinner, if you still have energy, a walk through Gion is a great idea. Start from Shijo-Ohashi Bridge (the big bridge on Shijo-dori over the Kamo-gawa River). At the east end of the bridge, cross Kawabata-dori and walk north on the east side of Kawabata for about 100 meters. You will soon see a tree-lined pedestrian lane. This is the end of Shirakawa-dori. Follow it east and you’ll get to the Shimbashi District (also known as Shirakawa), which is the most beautiful street in Kyoto. In busy seasons, it will be crowded with people. After checking it out, make your way through the alleys south to Shijo-dori and walk east to Shijo and cross over into Hanami-koji, another picturesque lane. This is geisha territory, so keep your eyes peeled. Your choice of transport out to Arashiyama will depend on where you are staying and your willingness to take taxis. See our Arashiyama District page for transport information to Arashiyama (scroll to near the end of the page). First, explore the superb Tenryu-ji Temple, being sure to check out both the inside of the main hall and the expansive stroll garden. Leave Tenryu-ji by the north gate (accessible through the garden), and take a left, which will bring you into the famed Arashiyama Bamboo Grove. Take your time savoring the magical atmosphere here, while working slowly uphill. At the top of the hill in the Bamboo Grove, you will see a small hut and a road leading up the hill into the forest. This is the entrance to the superb Okochi-Sanso Villa, the former home of a wealthy Japanese actor. Enter the villa and take your time exploring the garden. Be sure to hold onto the ticket they give you, because it will get you a nice cup of green tea and a sweet after the garden tour. Leave Okochi-Sanso Villa and return to central Arashiyama. Eat a simple lunch of noodles or rice in one of the shokudo (noodle and rice restaurants) on the main strip. 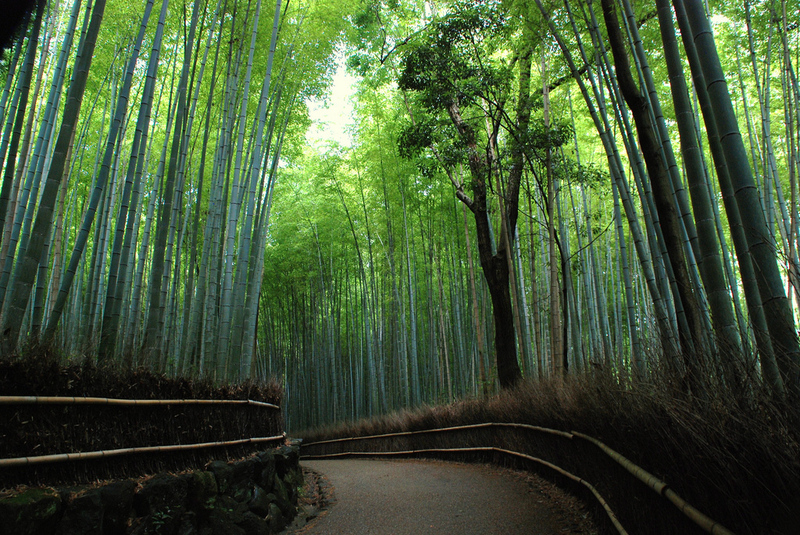 For some picks, see our Arashiyama District page. 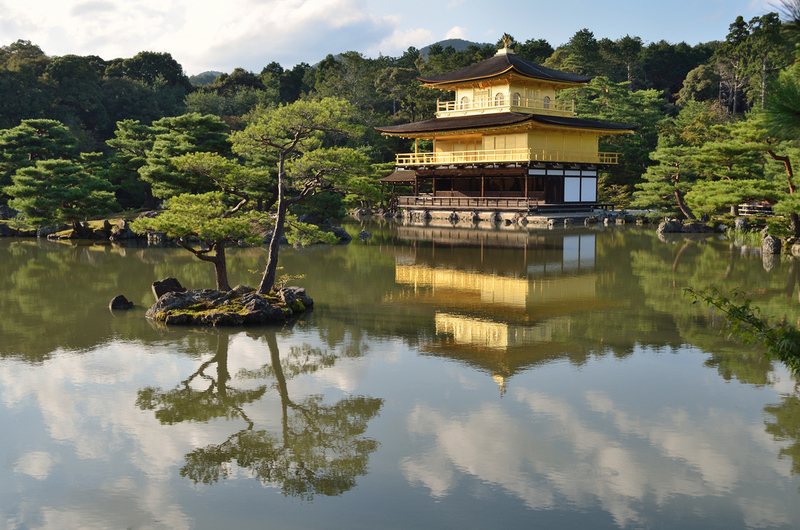 There really isn’t a good way by public transport, so from Arashiyama, take a taxi over to Kinkaku-ji Temple, the famed “Golden Pavilion” in Northwest Kyoto. A taxi from Arashiyama to Kinkaku-ji will cost around Y2,000. Take your time strolling through the grounds of Kinkaku-ji. Yes, it will most likely be crowded at this time, but it almost always is. Again, there’s really no good way to go by public transport, so jump in a taxi to Daitoku-ji Temple. It will cost around Y2,000 from Kinkaku-ji. Note that if you’re starting to feel templed out by this point, consider cutting out Daitoku-ji and just head back to downtown Kyoto. Buses run for the Kinkakuji-michi stop to downtown and Kyoto Station. 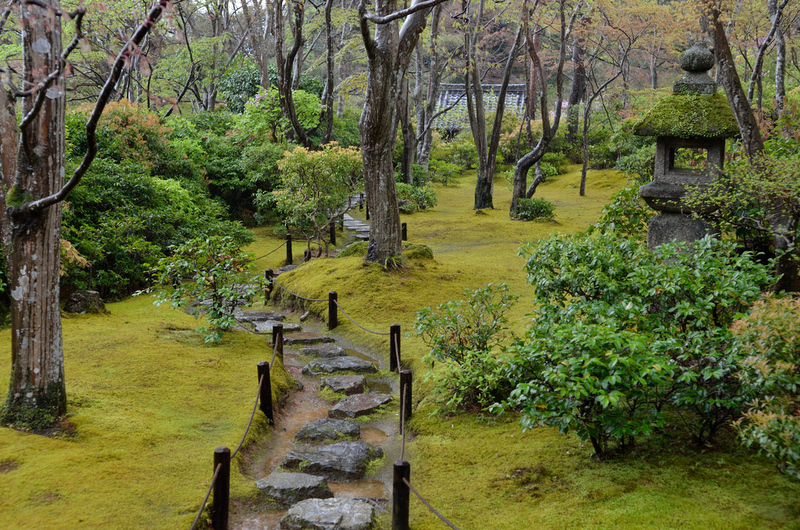 Explore the Zen world of Daitoku-ji Temple. Consider entering one of the subtemples like Koto-in. For full details on Daitoku-ji, see our Exploring Daitoku-ji Temple page. From Daitoku-ji, it’s about a 20-minute walk east on Kitaoji-dori Street to reach Kitaoji Station on the Karasuma subway line. This subway will get you downtown or to Kyoto Station in a few minutes. By this point, you’ll certainly be in need of some down time. 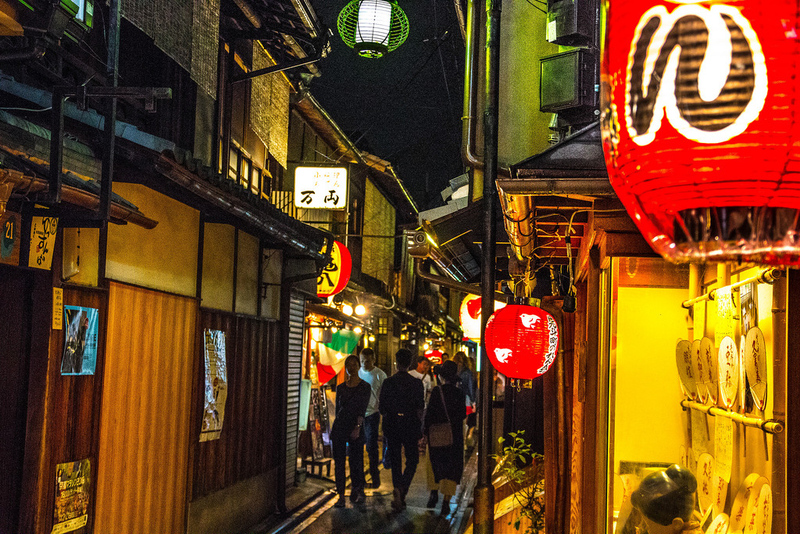 After dinner, consider taking an evening stroll along Pontocho Alley or down the lovely stretch of Kiyamachi-dori south of Shijo-dori.